It’s been a few months since I’ve been able to post photos of what has been changing in downtown Fresno. Unfortunately, I haven’t had the chance to explore the area and take photos, so I present to you a different type of update. Here are some photos I took in May, along with a look at what those projects look like this week, with photos sourced from friendly people around the web. It’s amazing how much (and how little!) can change in 3 months. And now it looks like this: Click to read more! 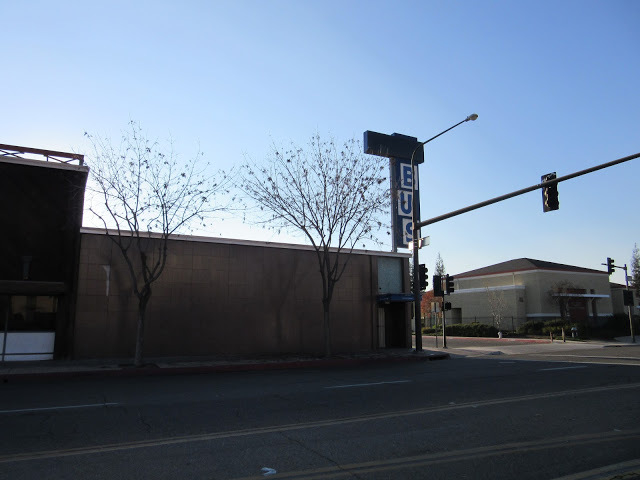 One of the most obvious signs of High Speed’s Rail’s (HSR) coming arrival to downtown Fresno has been the demolition – and now reconstruction – of the Tuolumne street bridge. The bridge was two lanes wide and carried traffic eastbound over the Union Pacific right of way. 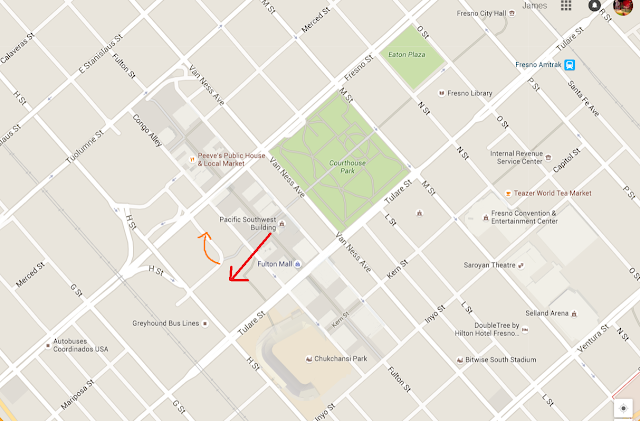 It was paired with the Stanislaus Street bridge which carries two lanes westbound. Both bridges will be demolished and replaced by a single bridge carrying traffic in both directions. The bridge will feature wider sidewalks as well. The reason is that aside from being 50 years old (or more? ), the current structure of the bridge does not allow enough room for the new High Speed Rail tracks to fit. 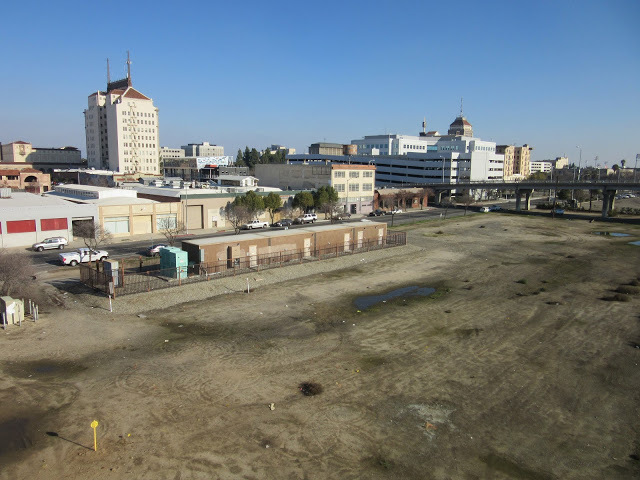 Once the new bridge is in place, and the Stanislaus Street bridge has been demolished, more serious work can be done downtown to create the new tracks and station. Click to read more! 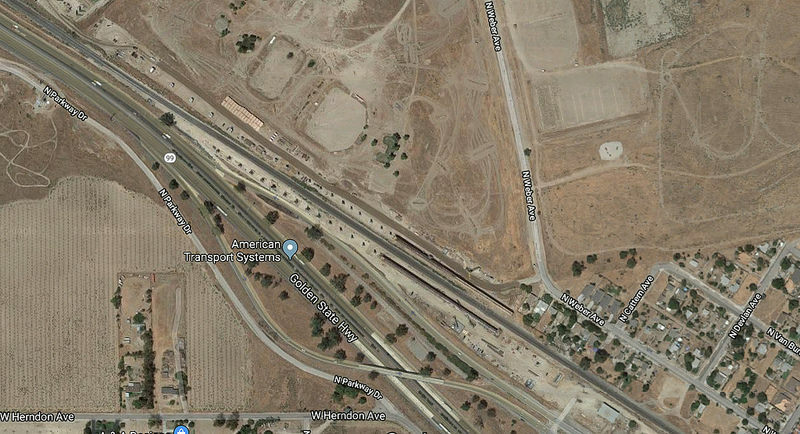 I’ve mentioned a few times in this blog that as part of the High Speed Rail (HSR) project, Gryehound has moved from their old location to the Amtrak station. For a couple of years, the old station will be used by HSR personnel, and then it will be demolished when it is time to build the new rail station in that very spot. Presumably, Greyhound will then move back. Let’s start by taking a look at the old station. Here we see the station with the baseball stadium in the background. The portion on the right used to be a cafeteria I have no idea how many years that side of the complex has been abandoned. Click to read more! About a month ago, I went out and took hundreds of pictures around downtown Fresno. The intention was to post them quickly, but that obviously didn’t happen. My post about the changes at Fresno State took a few days to put together, and then I was away from the internet for a week due to a planned surgery. 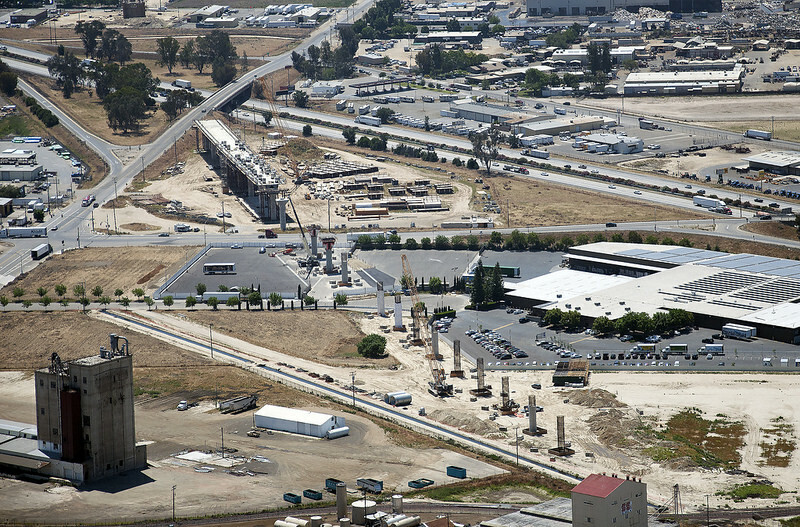 This set of pictures was originally intended to show the current state of High Speed Rail (HSR) construction in Fresno. However, a lot has happened in a month, so they’re no longer current in regards to construction activity on the project itself. 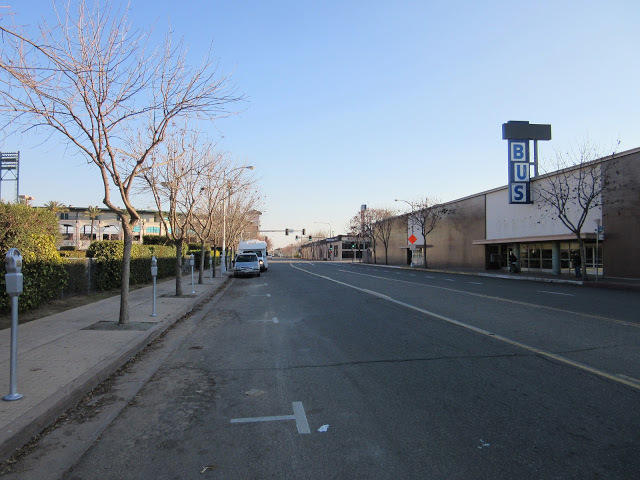 Instead, they will serve as a benchmark of what downtown Fresno looked like right before serious construction started in earnest, and before private investors started taking note of the prime empty lots. Click to read more! 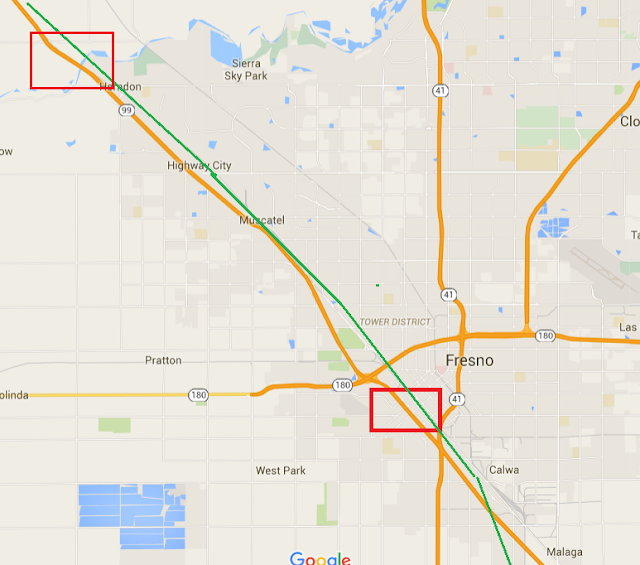 Is 2016 finally the year for High Speed Rail (HSR) in California? Construction has been underway on the boring part for over a year now – relocation of utilities, and demolishing of abandoned buildings. However, for most people, that type of invisible work doesn’t count. It’s hard to tell if a hole being dug in a street is for HSR or one of 200 other possible reasons, after all. We want to see real construction – that means bridges, tracks, tunnels, etc. 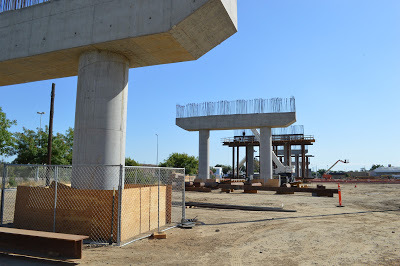 And so a couple of weekends ago, I decided to tour the High Speed Rail construction sites in Fresno to take a close up look at the real progress. I’ve done this tour before, for about three years now, and each time came up with a big pile of nothing. Was the January 2016 edition any better? Click to read more! One of the most frustrating parts about journalism in California, especially in regards to high speed rail (HSR), has been the inability of reporters to see beyond their personal bubble. Many times, it seems like these journalists take their own experience, and extrapolate it to be the “California experience”. For example, if they drive everywhere, then “everybody drives”. Or, when it comes to travel within the state, “everybody flies”. For a rambling discussion at the bar, that’s not an issue, but when these journalists write for major newspapers and get to set the tone, it loses all its amusement. Click to read more!